Expanding Paper have been developed to seal and insulate. These products possess the properties of ceramic fiber based products which include high temperature stability, low thermal conductivity, good thermal shock resistance and excellent handleadbility. 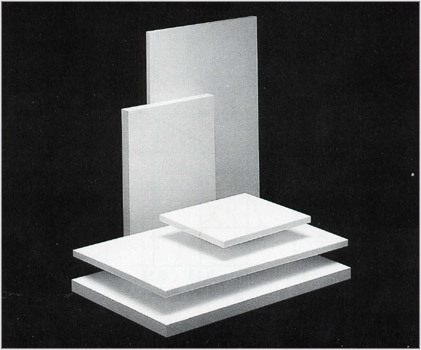 Expanding paper differs from traditional ceramic paper in high thermal expantion characteristics found in this material when exposed to temperature above 325℃. The thermal properties of expanding charcteristics make it capable of functioning well under thermal cyclic conditions. In addition, its thermal expantion properties ensure that a tight fit or seal be maintained over awide temperature range. These properties give merits in many high temperature gasket/seal applications such a pollution control equipment, oxygen generators and metal filters. Also, this products with above-mentioned characteristics offer the advantages in fire protection applications such as expantion joint, fire doors and fire proved cable tray and/or duct. This material can supply to meet a customer's requirement with sheet or roll and variaty thickness from 1 through 12mm. - For operating temperature greater than 1260℃. The combination with ceramic paper is recommended.